This is just soo typical for me–finding something haphazardly, deeming it the ideal, losing track of it and then spending really just ridiculous amounts of time searching for it again. But, considering without such, well, undoubtedly better-placed energies there would be a whole lot less of me and you at this URL, today I present to you: The Belgian Waffle. The waffle-maker is pretty much tops most lists of kitchen stuff you will buy and never end up using. Considering that an ex-boyfriend bought me this Krups one probably five years ago and I’ve used it less than ten times since, I’d not going to argue that you run out to purchase one, even for the sake of the recipe inside that I will not shut up about for the next couple paragraphs. Unlike a real, traditional, World’s Fair circa 1964 Belgian Waffle, which is yeast-raised in the refrigerator overnight, this one was more like a pancake batter in its simplicity, save for one thing–the egg whites were whipped separately, folded back into the batter making for a waffle that was both light but crisp. I loved the soft crunch on the outside, and determined this was the ultimate waffle but only got to making it once because I lost the booklet. The Krups website and countless Googles proved no help, and sure, I could just ask if you have this same model (odds are, one of you do) and to please share, but that wouldn’t be much fun, would it? Instead, I have tried a bunch of recipes since. The most recent one was made on Saturday morning, because I had a friend staying over and growing up, a houseguest always meant that we had waffles or pancakes the next morning. Always. I find myself doing the same, torturing my sister a while back with caramelized peaches on top of French toast made from my own homemade challah. This weekend I had buttermilk to use up and though it lacked separated egg steps, this recipe was so highly praised by reviewers, I gave it a shot. It was indeed delicious–I especially loved that it didn’t have much sugar inside, seeing how I slather mine with syrup, anyhow–but it had really no crunch at all. They were so soft that it took both a fork and a spatula to lift them out of the waffle iron and onto the tray in the oven to keep them warm. Still, they were tasty and tangy, just not, you know, that waffle. I think it’s really the whipped egg whites that were missing if you want that whole ever-so-subtly crisped exterior thing, thus I will instead present to you today the recipe that has come closest to the long-gone Krups one, one from Mark Bittman. Were I giving you a proper tour of homemade Belgian waffles, I’d also try a yeast-raised one, but I just haven’t gotten there–yet! Perhaps one more stay by a house guest will do the trick. Do I hear any volunteers? Combine the dry ingredients. Mix together the buttermilk, sour cream or yogurt and the egg yolks. Stir in the butter and vanilla. Brush the waffle iron lightly with oil and preheat it. Stir the wet into the dry ingredients. Beat the egg whites with the whisk or electric mixer (spotlessly clean ones work best) until they hold soft peaks. Stir them gently into the batter. Spread a ladleful or so of batter onto the waffle iron and bake until the waffle is done, usually 3 to 5 minutes, depending on your iron. Serve immediately or keep warm for a few minutes in a low oven. * The buttermilk can be substituted with 1 1/4 cups of milk at room temperature, mixed with two tablespoons white vinegar, left to clabber for 10 minutes. My mom makes waffles from a recipe that calls for separately whipped egg whites, and they are delightfully crispy. I don’t have the recipe, but one day I will get it and will send it to you! I have a similar recipe that I use for my homemade waffles. It’s the Special Waffles on page 555 of the Fannie Farmer Cookbook. Utterly delish. I often make them with whole wheat pastry flour and they are totally wonderful too — loads more texture though and some kids who haven’t been raised eating mostly whole grains have had trouble with them. In the 1960s there was a small tradition of waffle suppers, for which waffles were served with savory things. Try it. There’s nothing about it that is more difficult or less healthy than many other supper foods, including pizza. Depends on what you put on top, but that’s entirely up to you. Thank you so much- I have buttermilk left over from Irish Soda Bread and I love the crisp-tender texture of homemade waffles (it was one of the first small kitchen appliances I got when I was first married). Unfortunately, in my entire family, I am the only waffle addict so I cannot justify buying the belgian waffler I would really like to have, but this weekend (for me at least! ), there will be waffles! Somehow I’ve managed to avoid accumulating waffle makers in my overflowing kitchen gadget cupboard. Perhaps I just needed the type of boyfriend who would have bought one for me! I love waffles, but rarely eat them and never ever make them. So yes, sign me up for breakfast at your house! uhhhhh…ME! I volunteer! I’ll sleep on the floor in the hallway too. I love waffles and have a weird obsession with going to the Waffle House, a southern interstate staple, because of their ability to get crispy but soft waffles. Also, the hash browns. I could write a thesis on the different ways to serve and enjoy Waffle House hash browns. I’ll be there in three hours…am calling out of work right now. That waffle looks scrumptious; all the more so because I am running later and will probably only eat a South beach Diet bar for breakfast. Sigh….pine…. Haha Jenifer. You’re so right. Waffle House in all its infamous glory, was a staple of my teenage years. Many nights were spent sipping coffee and eating those glorious waffles until the wee hours of the morning. And don’t even get me started on the hash browns. My cholesterol level can’t take it. Deb, I”m going to have to try these. I, too, have not found a recipe for pancakes OR waffles that I’m happy with. They taste great, but lacking in one area or another. I’ll give yours a whirl sometime! Talk about pining! You’ve just presented me with my son’s favorite dish and it looks fabulous! I grew up eating waffles made from bisquick and club soda that are so wonderfully light and crispy. I know how you probably feel about baking mixes (and especially bisquick! ), but it is certainly quick, dirties only one bowl, and is very light and crisp! And, hey, if you can figure out how to do it with flour, trans fat-free shortening and baking powder in place of the mix, even better! Every thrift store I’ve ever been in has had at least three waffle makers priced at under $5. That’s how I got mine and I don’t feel guilty that I only use it when the Grandchildren come to visit because it cost so little. I will be trying your recipe soon. The best recipe ever is Marion Cunningham’s yeasted waffles. It’s probably in her Breakfast Book. She made them for me one Sunday, then took me out to her garage to see the black widow spiders that lived there. Am not sure which experience was more memorable. The waffles, the scary spiders, or Marion’s tour of deadly spiders. Nicole — That’s it! In fact, um, I just finally found it online too. (Page 7 of this PDF.) I swear, it wasn’t there last time I checked. The good news is that the one above is pretty much the same, except the original has 1/2 cup additional flour, 1 additional egg and suggests oil instead of melted butter. I’d stick with the butter but next time, might try that extra egg and the flour to compensate. I’ll add a note above. Waffles are delicious – I favor the recipe from the Joy of Cooking – that one calls for beating the egg whites separately. The best thing about that recipe, though, is it offers you a great variation in butter requirements. Something between 1/3 and 1 cup of butter. I tend to err on the excessive buttery-goodness side. Adding a touch of almond extract topping with a big mess of sauced-up strawberries seems to be my perfect Sunday afternoon breakfast. Here is one more person guilty of purchasing a waffle maker and then letting it collect dust in the basement. We’ve been talking of chicken and waffles lately, but now that I’ve seen the bananas on these, that’s where I think I’ll be heading. As for the breakfast invitation, please sign me up. Maybe we could just swap kitchens, mine is a short drive from the end of the Metro-North line in Poughkeepsie. If memory serves, the waffle recipe in the original NYT cookbook has the egg whites whipped separately and folded in – it’s our standard recipe and makes nice crispy plain waffles. And spare waffles freeze wonderfully, for instant breakfast later on. And for raised waffles – the Marion Cunningham ones mentioned by David are seriously awesome (though I’ve always had to make them myself…). I love my waffle maker – it’s from the 40s and works splendidly. How fitting, considering that Sunday was International Waffle Day, known in Sweden as Vaffledagen! I have been putting off the urge of buying one for over a year now. However I just remembered that the inlaws have one (I know this because the first Christmas I spent with them they hyped that we would have home made waffles. Imagine my shock when I saw the bisquick shake and pour bottle) I may have to go borrow that! i can’t remember the last time i made waffles. these look particularly appetizing, as do all your dishes really! I didn’t know waffle day was coming up. Gee, before I entered the blogosphere, I never knew there were so many days dedicated to all my favorite foods! Coming out of lurkerdom to say that the waffle recipe in The Joy of Cooking is tops in my book. It uses a lot of butter and I whip my egg whites seperately and fold them in (I don’t think that recipe says to do that) just before cooking and the waffles are light, crisp and delicious. Growing up, my family often savoured Sunday morning waffles. Until, one fateful morning, something happened to the seasoning on the waffle maker and it ceased to be able to create the perfect waffle. This presented a problem, as we had the perfect waffle recipe (with the whipped egg whites), batter already made, but no waffle maker. So we made pancakes. To this day, it’s the only recipe my mum will use for pancakes. So for those of you without waffle makers, rest assured that you too can enjoy the fluffy lightness, and the crispy outside of waffle batter – only in the form of pancakes. Thanks for the constant inspiration Deb! Ok, just to add to the chorus of waffle lovers, I too insist on the beaten egg white. My quintessential waffle recipe is very similar as well. My sister and I bought my parents a new Belgium waffle iron (it made one, big waffle) for their 12th anniversary. They just celebrated their 35th and still use it. There’s nothing like the smell of waffles cooking in the morning…yum. My stomach is growling. Oooh, Andrea, thank you! I’ve been complaining about not having a waffle maker since my last move last year, and you’ve just given me an idea for my weekend breakfasts! I am so glad someone else thought of it because, man, would it have taken me a very long time to figure out! Deb, those waffle pictures look fantastic. I already know I shouldn’t read your blog when I’m starving, but I do it all the time! This post reminded me that I used to buy the best sauce in the world for waffles – tiramisu flavored – but sadly, I’ve not been able to find it in stores in North America. I probably should not admit to this because I will likely be stoned by all of you waffle efficiando’s. Maybe this is not the topping for the “perfect waffle” that everyone is coveting but one of my super secret closet food loves is a PB&J waffle. Take that hot waffle and smooth the creamy peanutbutter over it and let it melt into the squares and then add grape jam ( I never use jelly ..its too wiggly) and top the whole mess with maple sryup! MMMMMMMMMMMM SOOOO Yummy! Now I’m pining as well. Here’s the recipe with the… OH the whipping… egg whites… Stolen directly from the hands of Emeril. Preheat the waffle iron according to the manufacturer’s instructions. In 1 medium bowl sift together flour, baking powder, and salt. Set aside. In a second bowl use the wooden spoon to beat together the egg yolks and sugar until sugar is completely dissolved and eggs have turned a pale yellow. Add the vanilla extract, melted butter, and milk to the eggs and whisk to combine. Combine the egg-milk mixture with the flour mixture and whisk just until blended. Do not over mix. In third bowl, beat the egg whites with an electric mixer until soft peaks form, about 1 minute. Using the rubber spatula, gently fold the egg whites into the waffle batter. Do not overmix! Coat the waffle iron with non-stick cooking spray and pour enough batter in iron to just cover waffle grid. Close and cook as per manufacturer’s instructions until golden brown, about 2 to 3 minutes. Serve immediately. We got our waffle maker and used it every week for months. We have fallen out of the habit but every once in a while it still makes an appearance, usually for guests! We never make any of your elaborate recipe styles, but this one doesn’t look too hard and I do love the crunchiness. i’m delurking because i was so excited to see a waffle posting. my husband and i registered for a waffle maker for our wedding 5 years ago because why not?, and we wore it out. wore. it. out. to replace, we bought two waffle makers because we simply cannot wait for one at a time. plus, it’s our standard houseguest breakfast, so we need to crank ’em out from time to time. my husband, the breakfast specialist, swears by the cooks illustrated recipe, but often skips the egg white whipping part since we now have two hungry toddlers squirming for breakfast. but i love all the posts with all the yummy-looking variations. i also enjoyed your Enoteca recommendation. my husband and i will be in new york in a month, and i’d love get a few other recommendations from you in the same vein of good food, reasonable prices. thanks for such a great site! you’ve inspired my cooking. we have a million waffle makers – we used them all when we catered our wedding (it was a belgian waffle brunch). we still have waffles pretty regularly, too, because i lurve them. anyway, as you might imagine, i have a million waffle recipes, including one that i was thinking you’d really like, but it looks like you found your pot-o-gold. post pics of the perfect ones! I’m not sure why so few people are willing to whip up a batch of homemade waffles. They’re so much simpler than pancakes. No sweating over a griddle needed…just spoon the batter into the waffle maker, wait a few minutes, and you have something sublime! I actually make waffles fairly often….once or twice a month. They *seem* like a special treat but really take no more time than making a bowl of oatmeal. We have a small Belgian waffler that takes up very little space in my appliance cabinet. True, it only makes one, plate-sized waffle at a time. But some things are worth waiting around for! Like Wendy, I use the Cooks Illustrated recipe…whipping the egg whites only when I’m feeling ambitious (and, honestly, there is little difference between the whipped and unwhipped versions). We just moved, but I see I’m going to have to unearth our waffle iron. At the opposite end of the sweetness spectrum, a little hole-in-the-wall Belgian waffle place has opened here in Chicago: Baladoche, in the Lakeview neighborhood. Instead of Brussels-style waffles, they serve the kind made in Liege. The dough contains sugar pearls that burst and caramelize in the hot waffle iron, creating sugary waffles that don’t need toppings. Ideal for grabbing at their walk-up window and eating as you head down the street. Plenty of toppings are available, though, as are 16 seats for those who want to sit and eat and enjoy an espresso. Well we have plotted a way of getting the in-laws waffle iron in our home. To avoid the fiasco that was Thanksgiving (and to avoid the hell that was last years Easter) we are going to ask to host Easter brunch, at which we will serve waffles. Since the Dr. has put the inlaws on a carb restricted diet they usually wait until a holiday to eat stuff like this. I am thinking that once it is in our house we can keep it for a couple of months just to see how much we use it before investing. See what you made me do? You pine and then I scheme. Hi Deb — I’ve been reading you for at least a year now. Fabulous pics, yummy food, and such an entertaining writing style! You’re probably inundated with waffle recipes at this point, but as I too made waffles on Saturday (and have been cooking leftover batter each morning since) I just had to share. This recipe is so simple and results in a very crisp-on-the-outside Belgian waffle. This week, I even subbed two-thirds whole wheat (not pastry flour) and they turned out very well — still crispy though not quite as light. I think maybe the secret is all the baking powder! Sift together in a large bowl the dry ingredients. Add to dry mixture everything else. Beat until well-blended. This keeps perfectly in the fridge for at least 4 days. Oh, I am soooo making these… for dinner on Friday… yummy…. Judith, my hubby’s family used to have waffles and chicken and gravy. First time I heard that I was seriously icked… but why not? It’s like a big crispy biscuit that holds the gravy better. Mix in order, fold in stiff egg whites at end. Mmmmmm deeeelicious! I’m not sure if it has been mentioned, but if you replace 1/4 cup of the flour with 1/4 cup of cornstarch (in addition to beating your egg whites) you end up with waffles that are soft and delicious inside and perfectly crispy outside. They’re perfect, and freeze very well so you can have waffles on Tuesdays…or some other crummy non-fancy-breakfast day. you *must* try the yeasted waffle recipe in said cookbook (how to cook everything by Mark Bittman). It resulted in the best waffles my husband or I had ever eaten. They are so worth the thinking-ahead. oh yeah- we use a krups, too. delicious! I am going to have to give the yeast waffles a try. These ones look so good though… I am certain your guest was pleased with breakfast! Whipping the eggs white is an unnecessary step-it does not make the waffles crisper-and the volume advantage is lost because of the heavy pressure of the waffle iron lid. If the waffles are too soft, check heat and cooking time. some time ago i received a yeasted waffle recipe from a friend, and like so many of my favourite recipes, it’s a splattered, loose sheet that floats around, getting lost regularly and found when you aren’t looking for it. It is really in a different class from the baking-powder waffle:: my kids are often the ones who ‘find’ the unmixed lumps of baking powder in those. eww. thanks for this new buttermilky recipe!! Really awesome recipe. Fluffy and crispy. Used it with the new Williams-Sonoma Nordic Ware stovetop waffle pan, which I’d highly recommend. Just stumbled upon this, looking for a buttermilk waffle recipe. I just wanted to point out that there is a really great yeast-raised waffle recipe in Staff Meals, by David Waltuck of Chanterelle. Every time I make those, people just eat them up! amazing. once again you have made our day richer. I made these waffles and they were awesome! I will be making them again! My kids just loved them! Thank you! Totally agree Joy – we use this recipe for pancakes all the time (too lazy to drag out the waffle iron, to be honest). Makes a fluffy pancake with crispy edges. Hey Debs, Ive just made this today (31st Jan) for breakfast for my two kids in Scotland – we loved it…….loaded with rowse organic maple syrup and bananas…….and the best part was, my friend didnt want his waffle maker anymore so gave it to us……………yahoo, more to come!! great recipe – between you and Ree, my kids are gonna be well looked after in the food department. I loved the taste of these waffles. Mine didn’t turn out crispy on the outside though. I used whole wheat flour though, maybe that was the problem. I’ll try adding a little bit of baking powder next time. I have a recipe for waffle batter with the egg whites beaten separately, and no sugar at all in the batter. They also include buttermilk. It’s not from the Krupps book but it was given to me by a good friend a few years ago. I just made it 2 days ago and loved the light, crispy texture. Then I found this post on your blog. I won’t post the recipe here as I read the comment guidelines but it’s not something you can find on the web. If you are interested, you can email me and I will send it to you. It will make all your waffle dreams come true! I just tried these, and they were lovely! Topped them with jam, and they really held up to the thick fruit! My fiance was determined to have waffles this past weekend and he looked up a different recipe online…it was a disaster and not at all what we wanted so we chucked it and I looked up this recipe here….only problem was that we didn’t have buttermilk and the yogurt we had was full fat greek yogurt….so i used that and made quite possibly the world’s most fattening waffles. They were so rich we could only eat one each…but the flavor was great! We can’t wait to try this recipe with actual buttermilk!!! I realized midway that our waffle maker was filthy, so I turned these into pancakes, which worked out pretty well. Deb, are you still looking for “THAT waffle”? If so, I have a recipe for your auditioning. It’s from the Farm Journal’s Country Cookbook, and for ten waffles consists of: 2 cups flour, 3 tsp baking soda, 1 tsp salt, 2 cups milk, 4 eggs (separated), and 1 cup butter. Combine dry, combine milk + yolk, beat whites into peaks, combine dry + milk + butter, fold in whites and go. AMAZING. (Pics and details are on my blog.) Would love to know what you think! Wheres the link to a pic of that gorg lil boy of yours!! This post was 2.5 years before he was born. The are some of the best waffles! I added a little nutmeg and cinnamon, and topped them with whipped cream and bananas, it was heavenly =] keep up the good work Deb! I made these with the alternate yogurt/sour cream thinned with milk – the batter turned out incredibly thick (like almost as thick as bread dough). I added a little more milk and the egg whites loosened it up a bit – but it was still very thick. The waffles were delicious but INCREDIBLY heavy (I think because of the batter) – so I’ll try just buttermilk next time! I took the alternate because I’m somewhat lactose intolerant. I made these this morning, using a mix of plain and lemon curd Ellenos Greek yogurt with milk instead of buttermilk, and my batter was waaaaay too thick. So I added a bit more yogurt, some more milk, and then a dash of half and half (because I started getting paranoid that it would get too thin with just milk). Got it to what I thought was a good enough consistency, then added the egg whites. They were amazingly awesome tasting and a bit crispy on the outside. I suspect the Greek yogurt was heavier than regular yogurt would’ve been but oh my they were delicious so losing a little lightness didn’t matter! Yum! I tried out a variant of this over the weekend, subbing half the flour for ground oats, and adding chopped sunflower seeds for a little texture and flavor. And even with the changes, they came out delightfully airy and crisp! I made the sour cream version and it made me never want to make waffles again because it was so frustrating. The batter became the consistency of bread dough, which in turn completely borked my mixer. I ended up adding about 1/4 cup more milk to make it workable again. The egg whites were incredibly difficult to mix in because of how thick the batter was. In the end, the waffles weren’t actually that exciting, either. This is the first time I’ve been disappointed by a recipe here, and it was a pretty big one. :( I’ll stick to the recipe that came with my waffle iron. Thanks a lot for providing individuals with an exceptionally remarkable chance to check tips from this website. It is always so ideal and packed with a good time for me and my office peers to visit the blog at minimum 3 times every week to study the fresh things you will have. Of course, I am also usually pleased with all the staggering tips and hints served by you. Some two ideas in this posting are unquestionably the most beneficial we’ve had. Just made them for brunch. And we’re walking it off. Delicious!!!! Love the recipe! hm I’m torn about these. I did get a crispy golden brown outside and a chewy light inside but the flavor wasn’t remarkable. A little bland despite the great tang of the buttermilk. So bottom line is, good technique tips here, but lacking in the flavor department. Beth – please post the yeast waffle recipe! I tried this waffle & it’s amazing! (milk+vinegar & buttermilk) They are light & crisp (like eggos!) but as julia stated… they have no flavor. I’m just wondering how eggos get there’s to taste so… heavenly! I love popping them into the toaster & eating them plain… omnomnom! One thing I have learned since I got my waffle iron for my birthday, is to leave the waffles in until you don’t see any more steam rising from the waffle iron. They get a little darker than the traditional ideal you see in cookbooks, but who carea about that? They aren’t terrible dark, just brown. My recipe is a little different from this one, mainly it calls for 1/2cup of oil or melted butter and I think that has more to do with the crispness of the waffle (along with the no steam thing). I guess it sort of frys the batter in the iron. The waffle Iron I was give, a Waring Pro, is one that has a pivoting handle and you flip it over after you close the lid..and if that weren’t enough, it’s a dual iron, so I get 2 waffles at one baking! I’m also thinking that the flipping over it stops the batter from settling. The interior of these belgian style waffles are so airy and light, I just love them. It’s downside is that it’s enormous; I have nowhere to put it. If it had 4 long straight legs, it could be a kitchen stool. Now, that would be handy. My, oh my, oh my! Required a few extra steps from my regular waffle recipe, but the results were well worth the extra work. My little family is gobbling these up on this chilly fall morning … perfect. Ha! I was so excited you’d posted a buttermilk waffle recipe only to laugh at myself in my quest for that penultimate waffle when I found it was Mr. Bittman’s, a recipe I already have. Thank you for confirming that it is a great recipe! I just made these and cut the recipe in half. I’m not sure what i did wrong! They were very dense and didn’t seem to cook all the way despite being left in for along time. Any help would be great…could it be a poor qaulity waffle maker?I want to retry this:)! Hi, I am just 5 years late, BUT a Krups Waffle Maker I have and a manual to go with it since yesterday was the first time we used it and I have yet to misplace the manual! Cooking Time: approximately 5 to 5-1/2 minutes. 500g plain flour, 1/2 tbsp baking powder, 400g melted butter, 400g caster sugar, 200 ml milk, 1/2 packet vanilla sugar or 1/2 tsp vanilla essence, 5 eggs. -Beat the egg whites to form stiff peaks. -Gradually add the remaining ingredients, finishing with the stiffly beaten egg whites. -This batter is best made the day before and kept in the refrigerator. Deb, would you mind terribly telling us which of these recipes you remember so fondly as being perfect? Thx! LOVE your blog! I cannot remember at all, sadly. It’s been eons — nearly 5 years since this entry and even more years since I had those perfect waffles. I have the same Krups waffle iron and I use the recipe in page 7 of the PDF you have above. However, I have never added the 1/2 cup of oil to the batter, as when I was reading the method in the recipe I didn’t see a step to add it, so assumed it was merely for coating the iron. I have to say the batter and the waffles are great without it and also makes a great pancake batter too. 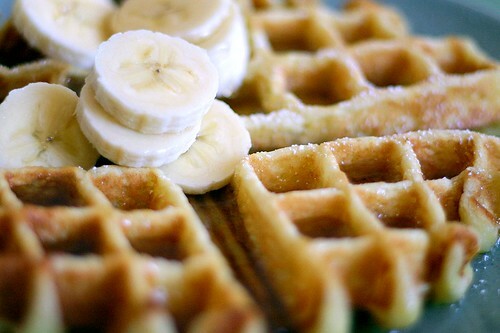 Just made these waffles for breakfast using a gluten free brown rice flour mix. They were delicious! Thanks for sharing your recipes — I have tried quite a few now with really great results! Excellent with greek yogurt! Made a half recipe but added more milk to thin out the batter. Your shared recipes have always exceeded my expectations! Thank YOU! So, thanks for the recipe. I almost backed out when I saw I had to whip the egg whites, but it really wasn’t a hassle and it was worth it! I finally had the opportunity and the buttermilk to try these. Used whole wheat flour because that’s pretty much what we use in this house. I have the old waffle maker that was my mothers, which she gave me for a wedding present centuries ago. The waffles were so wonderful that the family forgave me for not using the traditional waffle recipe that was my mothers, and devoured everything I made. Made these today for Mother’s day and they were AWESOME! Thanks! Made these on Christmas morning for the whole family with a brand-new waffle iron that Santa brought. These were PERFECT waffles! Not just okay, they were fabulous! Just the right weightiness without feeling like a heavy meal. Delicious flavor. We’ve got no more reason to go out to brunch now — these waffles complete us. I loved these! I made them for New Year’s breakfast. So easy — I whipped the egg whites first in the stand mixer while measuring out the other ingredients, then dumped in the buttermilk + egg yolks and mixed some more, then dumped in the dry ingredients and mixed by hand, and finally added the butter and vanilla and mixed a little more. I melted the butter in the microwave in the same 1-quart Pyrex that I used to mix up the buttermilk and egg yolks, so I only dirtied a few dishes. Also, I used brown sugar instead of white sugar. I usually make yeast-raised waffles, and I’m surprised to report that these are just as good! Now the leftovers are in the freezer and our house smells all waffley. I got a waffle iron for Christmas and have been looking for the perfect waffle recipe. This is it! I should have come here first. Can’t fathomy why I didn’t. And it would also be an awesome base for goodies like chocolate chips or blueberries baked right in. Thank you! I’d been starting to think I was waffle challenged. Nicole — Yuk! Thanks for letting me know. Hi Deb, Love your recipes, but this one didn’t quite work out for me. I agree with some of the other posts that the batter was too thick – making it difficult to fold in the egg whites and ultimately ending up with a very dense waffle. I mixed together all of the ingredients, barring the egg whites, the night before. They spent about 12 hours in the fridge, covered. Things didn’t exactly get fermented or bubbly due to the refrigeration, but it seemed somehow improved by its overnight sleep. Then I whisked the egg whites, folded them in as you describe, and made the waffles as you described. Delicious! You always come through with your recipes. Why oh why didn’t you come to La Jolla on your book tour? Luckily my niece (another Deb fan) works for Book People in Austin and was able to snag your book for me. I’ve been waiting to break in my new waffle iron for months now and this recipe really caught my eye. I love the addition of the egg whites which makes the waffles lighter and less dense. I made a batch with yogurt and added a 1/2 C of milk instead of the recommended 1/4 C. The batter was quite thick, but I proceeded anyway. This batch turned out to be more bread-like, not bad, but not exactly what I was going for. Next time, if I use yogurt, I think I’ll try 1C. yogurt with 1C water or milk to make it more buttermilk-like. Or, better yet, I’ll just use buttermilk! I realize this post is ooooold. But…I was on the hunt for a delicious buttermilk waffle recipe and stumbled upon this one. I made it per your instructions, and it was a hit! My house smells divine right now. Thanks! Great recipe! This is my go-to everyday no-fuss waffle recipe!! I always have the ingredients on hand, it doesn’t dirty very many dishes, and comes together super quickly with room for variations. I still prefer your “essential raised waffles” recipe with yeast…for both flavor and consistency…but 90% of the time I don’t have enough heads-up for a recipe that requires overnight sitting AND I rarely have fresh yeast sitting around. So THIS is my go-to! It’s dense enough and light enough, makes the perfect amount, and is crazy easy to put together. For those of you who are finding the batter to be too “dense”….in most baking endeavors, you need to use a little common sense. If the batter is so thick that it doesn’t easily fall from the scoop..splash in a little milk to make it slightly closer to the consistency of pancake batter (I always do this). I also always leave these waffles in my waffle-maker to bake for just a minute or so extra to make sure the outsides are crispy….and eat them immediately!! Before the steam from the inside softens the outside. just made these. might i suggest….do not use sour cream as a substitute for buttermilk. i used mainly yogurt but needed to add 2 T. sour cream as suggested (as i was out of buttermilk)….the taste was that of sourdough bread. very strong and pungent. not what you want in a good waffle, well, not what i would want. even with the help of a gallon of maple syrup. stick with the buttermilk. swear by your recipes, though. all of them. Beat egg yolks, stir in milk and oil. Add flour, sugar, baking powder and salt. Stir just until large lumps disappear. Beat egg whites until stiff and gently fold into batter. Bake and serve. Awesome! I did not separate the eggs and they are still a great waffle. I sub-ed in some whole wheat flour and I find the baking soda to be a bit too heavy (maybe because I didnt separate the eggs?). Either way, easy and yum! I also did not separate the eggs (kids needed breakfast ASAP, so no time) and I subbed 1 C oat flour for 1 C all-purpose, but the baking soda was too strong for us as well. I will try cutting it down by 1/4 tsp for next time and see if that makes a difference, as it was very pronounced in the taste of the waffle. I made them again and once again I didnt separate the eggs. I doubled the recipe and used 1 cup of whole wheat flour and a 1/2 cup of oat flour and the rest white flour… a scant T of baking soda and a buttermilk/yog mixture. They’re a hit… as always. Thanks! Oh, Deb, these were GOOD! And I love waffles, but I didn’t think to check SK first. What’s wrong with me?! The only thing I did differently was add 1 teaspoon vanilla extract because I like that flavor. :) Served with cooked cinnamon apples and … My mouth is watering just writing this. Love your site, love, love, love it! Haha I just this up and realized that I made the chocolate cake today and my hubby made your waffles! Looks like we will need to get out for a walk today. Thank you again for your amazing and yummy recipes. Made these this morning and they were phenomenal. Thanks, Deb! I actually forgot to put the butter in these, but they came out really well! Next time I’ll put the butter in to do a taste/ texture comparison, but I also didn’t feel like I was missing out. The smell of waffles when I don’t separate the eggs is different! But I will try your recipe with, not separate the eggs! I made this today and it turned out great! I think there is a typo in the recipe. The recipe says 1 3/4 cup of buttermilk or yogurt/sour cream/milk. But the asterisk at the end says if you do milk+vinegar, to only make 1 1/4 cup. So if you follow the milk+vinegar recipe, you end up using a 1/2 cup less liquid than the buttermilk recipe! I think that may explain why some people ended up with really thick batter. I made this recipe this morning, and followed it exactly, however the waffles were not crispy at all, and quite bland tasting. These are the best waffles. I will admit that in the middle of the recipe, I wasn’t feeling confident (I think because all the recipes I’ve found have ended with total disappointment in taste, crispness, fluffiness and sticky waffle batter on sides of maker for a long, unenjoyable cleanup). When I began and completed the folding in of the egg whites and felt the immediate silky smoothness of the batter, I was feeling better! My husband commented that he could not believe there was no batter drooling down the sides of the maker!! The recipe turns out to have the right amount for our family. This recipe is it. I’m done searching! Thank you so very much for sharing with everyone. I am hosting a waffle bar brunch and I’m looking for an easy recipe I can double or triple as needed, and will still be a great texture after sitting in a low degree oven for possibly an hour. This one seems friendly enough, or do you have a better suggestion from your waffle recipes? These are fine. I’d consider the ur-waffle recipe on this site to be these; they’re quite rich but the flavor is otherworldly. I was looking for a savoury waffle recipe and found nothing I liked; decided to change one of your recipes (never fail!) into a savoury one, omitting the sugar and vanilla, and slightly increasing salt plus added teaspoon of mustard to the mix. Best recipe that I have come across for waffles. They were very crispy and held their crisp. This will be my go-to recipe. I still had buttermilk left over after two weekends of making your cranberry orange rolls so I decided to try and use it up making these. I did half with blueberries, which worked out pretty well (aside from the time it took me to clean them out of the waffle maker), and made me think this recipe might work with other additions. Next time I might omit the sugar and crumble some crisp bacon into the batter, which would of course justify lots of maple syrup on top. I froze the leftovers and I expect they’ll do well in the toaster tomorrow morning! Thanks, Deb. I made these with 1 1/2 cups of plain Greek yogurt. They were wonderful! Thank you, Deb! Our new go-to waffle recipe!! Wonderfully dense, fluffy, and crispy all at the same time. I used the plain yogurt thinned with milk and subbed half the flour with whole wheat and they turned out perfectly. They’re hardly sweet but have a nice, rich flavor and with a good spill of syrup, my husband and I were singing their praises. I have a Wilton waffle stick baking tray. Do you think this recipe would work for that? Made these this morning. Thanks for the recipe. Important note: Can you please fix it so the ingredients read baking POWDER, not baking soda? I checked other sources of this recipe on other blogs, and it’s definitely in error here… the soda taste made them unpleasantly bitter, but I’m sure they’d be good with powder instead!